Occasionally people ask me about my "own" music. If I have ever thought about releasing a solo album...and I actually have put out two very small releases. One was called "Songs for vowels and mammals"
And the next one was called "Dial". I dont necessarily push for them and very few people have heard them. I really like wrking with people and collaborating. Also when I record something for myself the joy is very much in doing it at the time not necessarily fretting over distribution and record covers and all of that. I do them under the name Molesome. My own recordings started out as experiments with sounds. I wanted to learn the equipment and what better way than to use it in a musical setting. 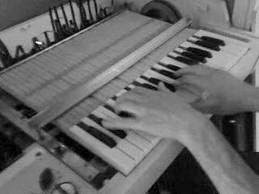 This one was kind of a circular idea using the Mellotron MKII Bassclarinet as the solosound. This little video was shot on Ekerö.